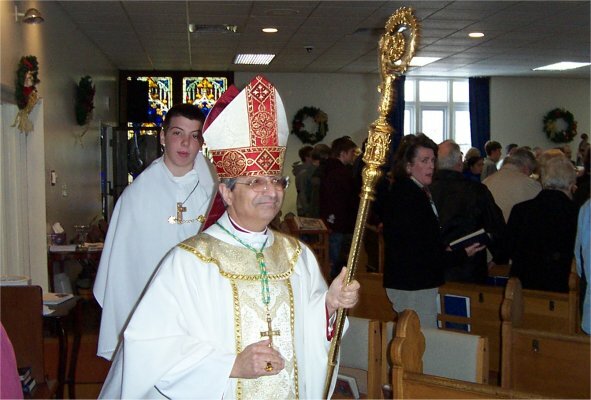 On Sunday, January 8, 2005, Bishop Matano, our new Bishop for the Diocese of Burlington came to Fairfax on the Feast of The Epiphany to celebrate the 11 a.m. Mass. Below are the smaller, some edited photos with limited identifications because of the younger subjects in the photos to protect their identities. Anyone having any objection to any of these photos being up here on the forum or in the slideshow, please send me an email at vtgrandpa@yahoo.com and I will remove them immediately. 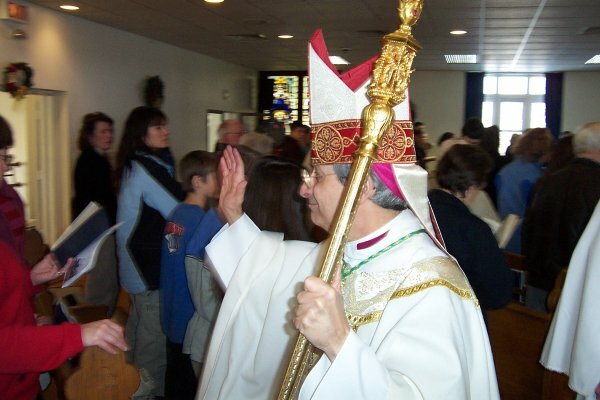 Bishop Matano enters St. Luke from the back of the church to celebrate the 11 a.m. Mass. 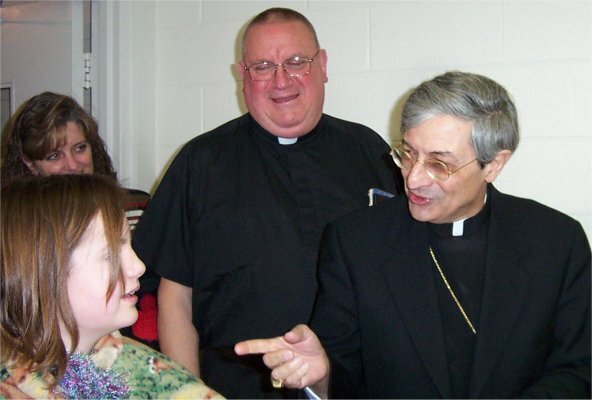 It was quite obvious that Bishop Matano has a real talent for getting the attention of our young people and adults as well as you will see in the photos taken at the reception. 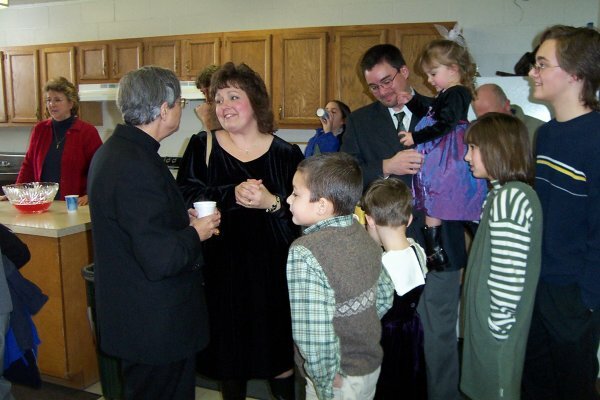 At the end of Mass, Bishop Matano leaves giving his blessing just prior to the reception to be held down stairs. 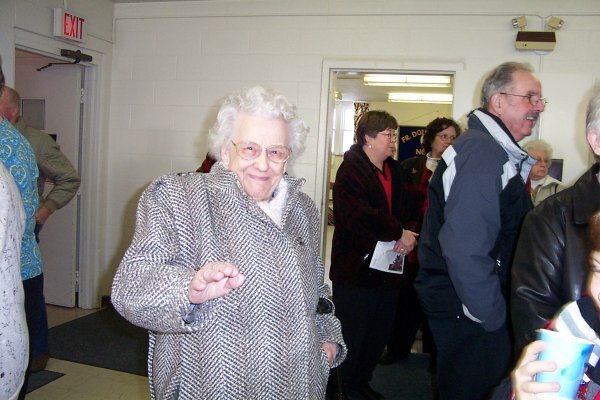 91 year old Gabriel Pouliot gives me a wave as she enters the reception hall. 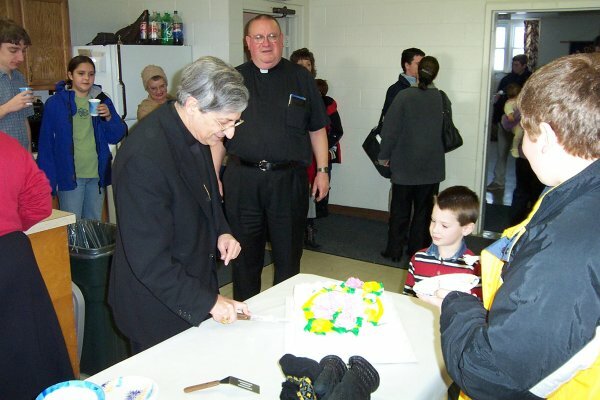 The ladies had a couple of cakes made and one was already cut, but this one was waiting for Bishop Matano to make the initial cut. He told everyone to start and not wait for him, but oops!!! as you can see the half empty plate on the right, a group of youngsters had already made quite a dent in the first cake. The first cut is made and I think the young man on the right is ready for the Bishop to slap another piece on his plate. 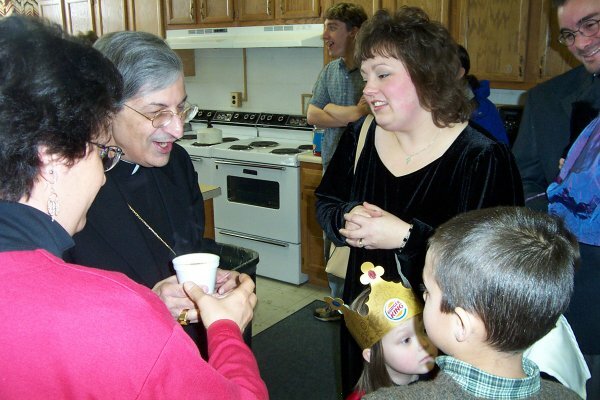 Bridget Morgan brings the Bishop a cup of coffee, while the young lady with the Burger King Hat decides she will look the other way as the Bishop attempts to chat with her. Ahhhhh!!! Yes, this mother does have plenty to keep her busy I think. 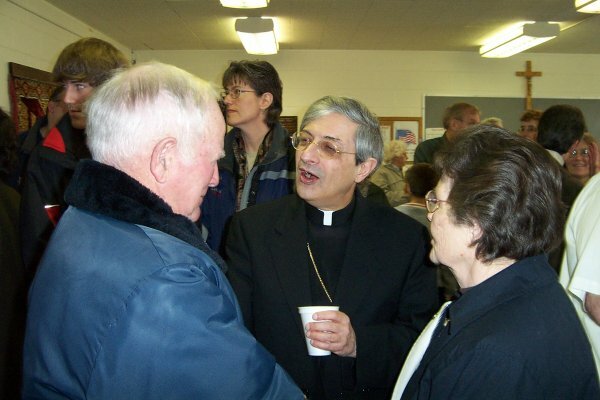 Jim & Donna Varrichione greet Bishop Matano. 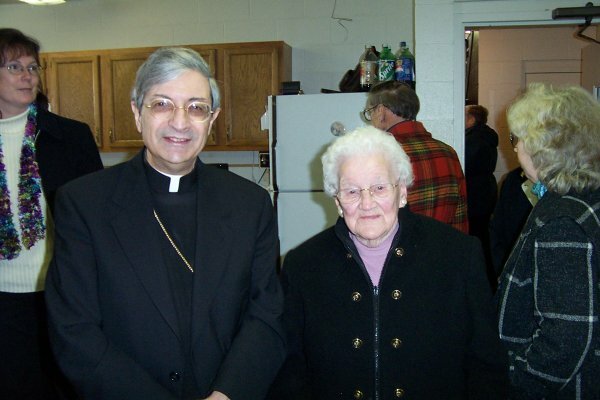 Our oldest parishioner as well as our oldest Fairfax Resident, 96 year old Imogene Collins poses with Bishop Matano. 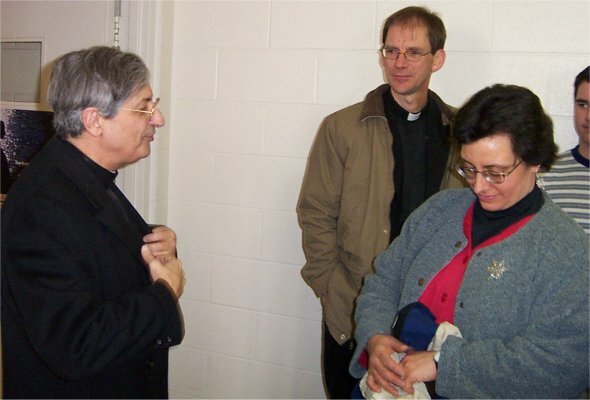 This mother introduces her daughter to Bishop Matano. 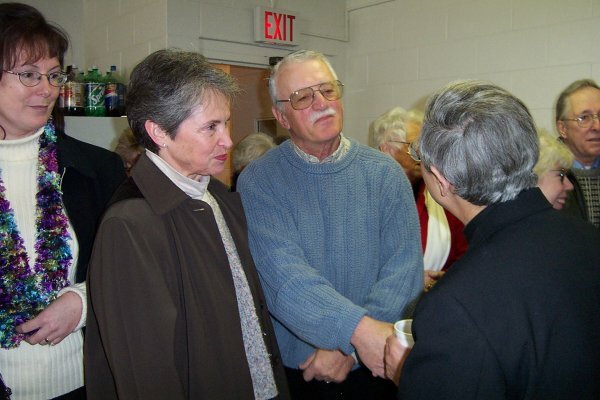 Mary Wright, daughter of Imogene Collins greets Bishop Matano. 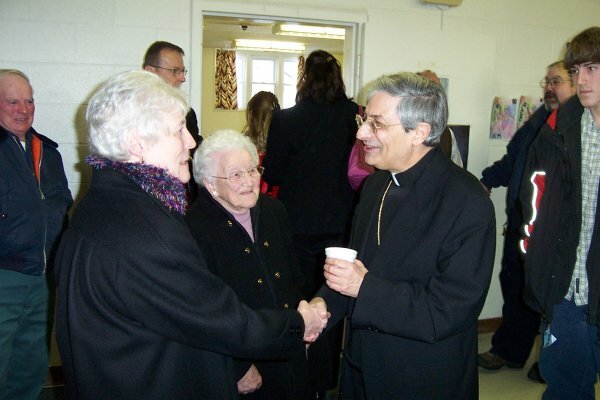 Barbara Lavallee in the foreground also greets Bishop Matano. 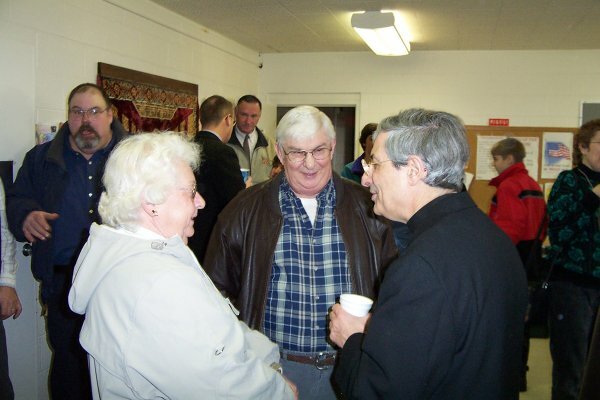 John & Betty Collins also get their opportunity to speak with Bishop Matano. 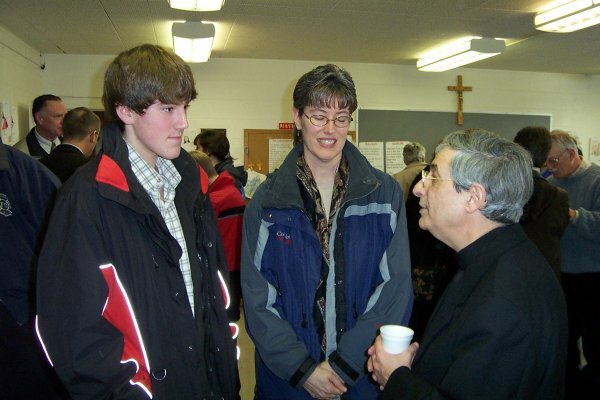 The young man on the left is one of our 11 a.m. Mass lectors and gets an opportunity to also meet the Bishop. 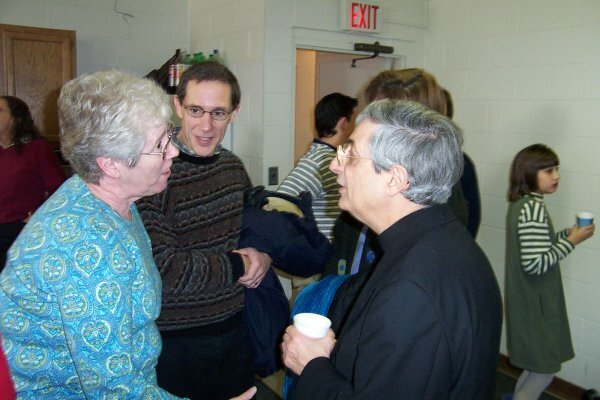 Joe & Cecille Rainville enjoy a conversation with Bishop Matano as Steve Bessette is shown standing on the left in the background. 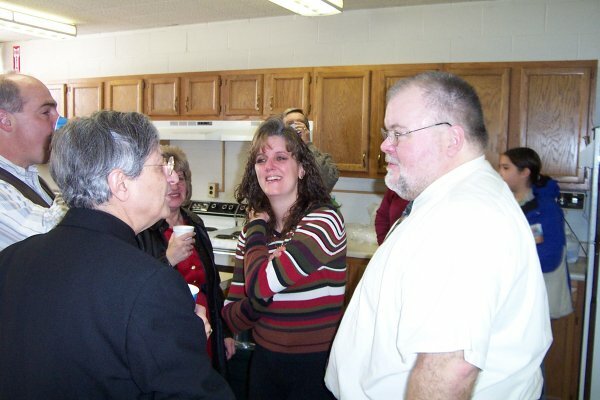 Having one of those Senior Moments and can't remember the lady's name speaking with the Bishop. Dave Vallett is the guy observing. 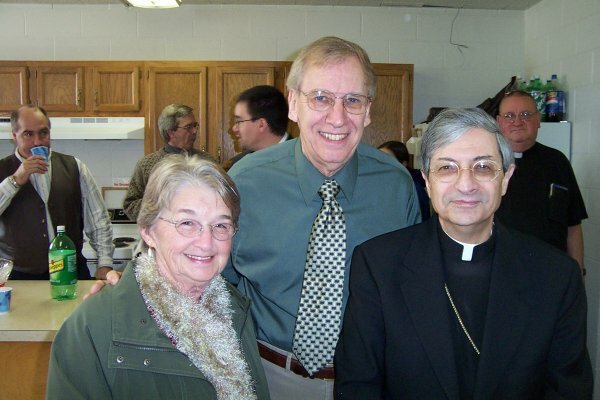 Deacon Steve Ratte and his wife Pauline take a moment at my request to pose with Bishop Matano. 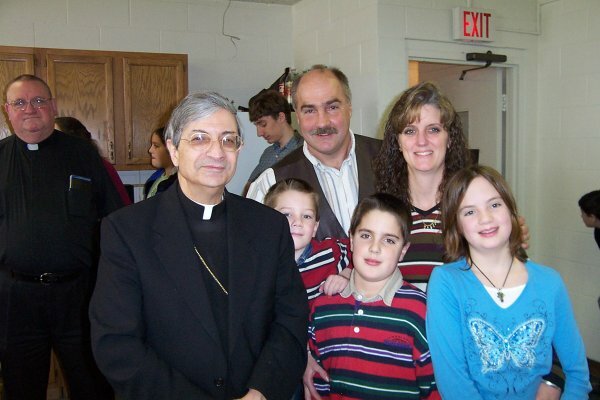 Another one of our larger families poses with the Bishop. Several of the youngsters volunteered to play a part in the Bishop's Homily. 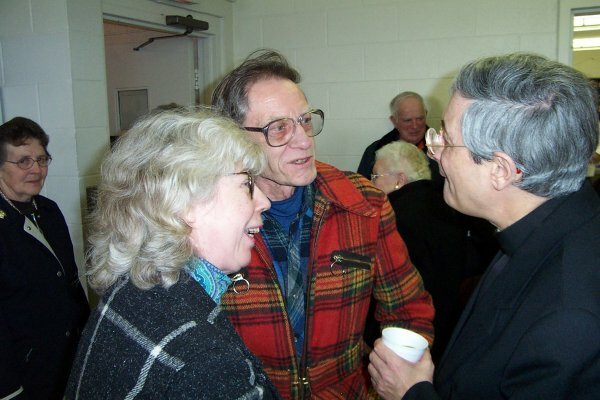 Bob Bessette, one of our music group directors, among others, chats with the Bishop. 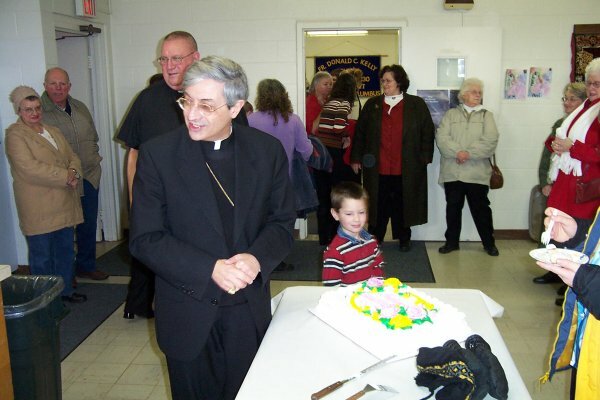 Bishop Matano buttons his coat as he gets ready to leave. Father McDermott, the new chancellor replacing Father Miller, stands in the background as Bridget Morgan bids him farewell. 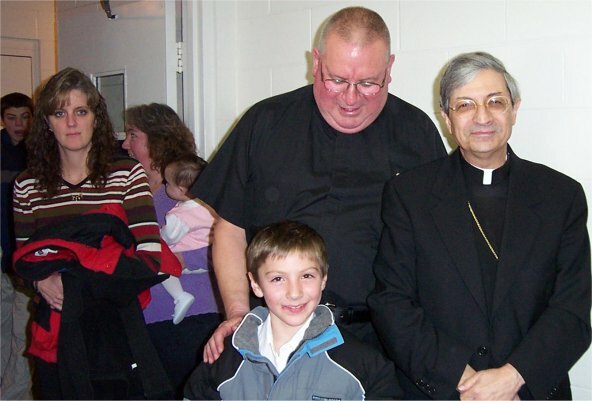 This certainly was a great opportunity for the parishioners to meet the Bishop. 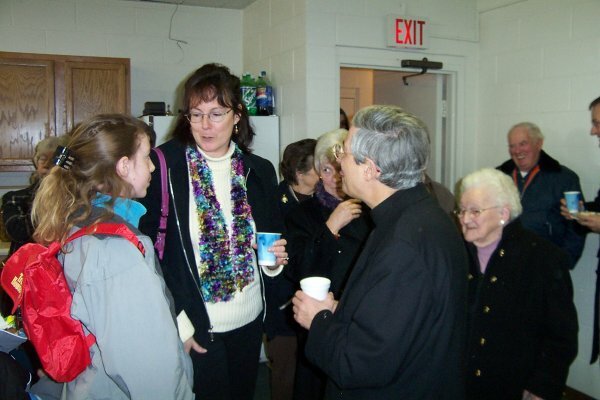 In years past, the Bishop usually visited the parish every couple of years, but now that confirmations are grouped in larger parishes, it has been close to 10 years since we have had a visit from the Bishop here at St. Luke. This was a very pleasant and uplifting experience for all of us.